From traditional manual thermostats to state-of-the-art digital ones, MoreVent offers a variety of solutions to fit your specific needs. Upgrading your thermostat is an easy way to take control of your home’s comfort and give you added flexibility in how you do it. While features vary from remote access to simple ventilation controls, programmable thermostats are all easy to use, contribute to improved system performance, maximize energy savings, and provide complete comfort control. In fact, using a programmable thermostat can save you up to 25% off your annual heating and cooling costs. Manual, or Non-programmable, thermostats put you in direct control your indoor environment. These simple set-it-and-forget-it temperature controls are available with digital and non-digital designs. While more simple, a non-programmable thermostat depends on you to make necessary adjustments to optimize your system performance. 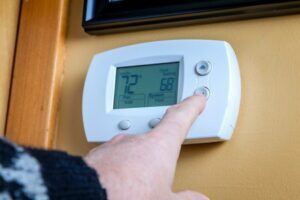 Many of the companies that make your AC and furnace also offer proprietary thermostats, made to their specifications, that allow your system’s specific features to be utilized to their fullest. Ask your MoreVent technician which thermostat is best for your specific needs.